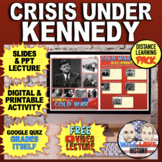 This is a five page unit from Reading Through History that highlights Fidel Castro's takeover of Cuba and the failed Bay of Pigs invasion which sought to overthrow him. It contains two one page readings. The first documents Castro's background and the events which surrounded his takeover of Cuba. 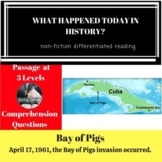 Bay of Pigs Informational Brochure Project!!!! This is a 20 question, open ended, webquest for the Bay of Pigs Invasion, which took place in the 1960's during the Cold War. 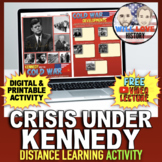 Students will go to history.com to answer the questions. Students simply follow the article and answer the questions. This covers the entire invasion from start to finish. 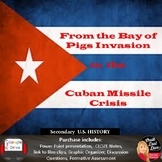 This resource include a description of the Bay of Pigs and primary sources on the event for students to analyze. 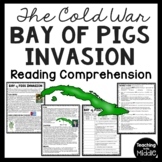 This worksheet includes key vocabulary surrounding the Bay of Pigs invasion and includes analysis questions to help students dig in deeper!